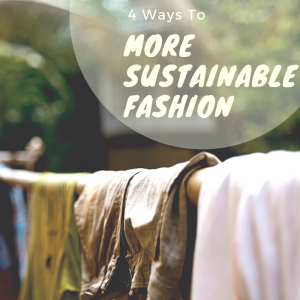 Sustainable fashion has a broad definition. It ranges from buying from and donating to second-hand clothing stores to decreasing the environmental impact of agro-chemicals in cotton production. The question is how can we be more conscious consumers and choose products that are ethically-made and environmentally-friendly? Shop from thrift stores and second-hand clothing stores. Did you know it takes about 1,800 gallons of water to produce one pair of jeans? This number doesn’t even include the water used in washing the pair over its lifetime. Instead of buying new and wasting another 1,800 gallons of water, try thrifting your next pair. From Boston Garment District’s wide variety of thrifting opportunities to consignment shop chain 2nd Time Around’s high-end selections, there are so many local thrifting opportunities to check out in the Boston area! Sell or donate used clothes that you no longer wear. A good way of getting rid of things you don’t want is to post on the Tufts Facebook Buy and Sell page or the Tusk Marketplace. Through these platforms, other students can purchase items second-hand from you—so you can make money while you downsize your wardrobe. You can also bring your clothes to sell at stores like Buffalo Exchange or donate to others like Goodwill. In April, check out the annual Eco-Reps clothing swap where students can donate and trade clothes for free! Think twice before buying more clothes. In the age of fast fashion, we are quick to buy trendy pieces and abandon those no longer in style. Clothing sales have been skyrocketing — the fast fashion industry is expected to hit $2.1 trillion by 2025. These days, consumers buy 60% more clothes that they keep for half as long as people did just 15 years ago. Also, synthetic fibers like polyester emit 3 times more carbon dioxide than cottonduring their lifecycle. Rather than spending money on larger quantities of cheap clothes that create huge environmental impacts, consider investing in a few, long-lasting, high-quality pieces of clothing. Remember that you can find quality pieces at thrift stores without spending a fortune! Ask your favorite brands how your clothes are made. Fashion Revolution Week calls attention to social justice in the fashion industry. This April’s Fashion Revolution Week commemorated the Rana Plaza factory collapse, where 1,138 people were killed in 2013 due to unsafe working conditions. Many people have instagrammed and tweeted at the brands that make their clothes with the hashtag #whomademyclothes, building awareness of these disconnects between fashion producers and consumers. Small actions like these can pressure clothing companies to be more conscious of, accountable for, and transparent about their sustainability efforts, treatment of workers, and production methods. Watch the following ENVS Lunch & Learn Presentation to look at the environmental impact of clothing manufacturing and some of the cutting edge innovations from science and technology that are leading to breakthroughs in more sustainable production.